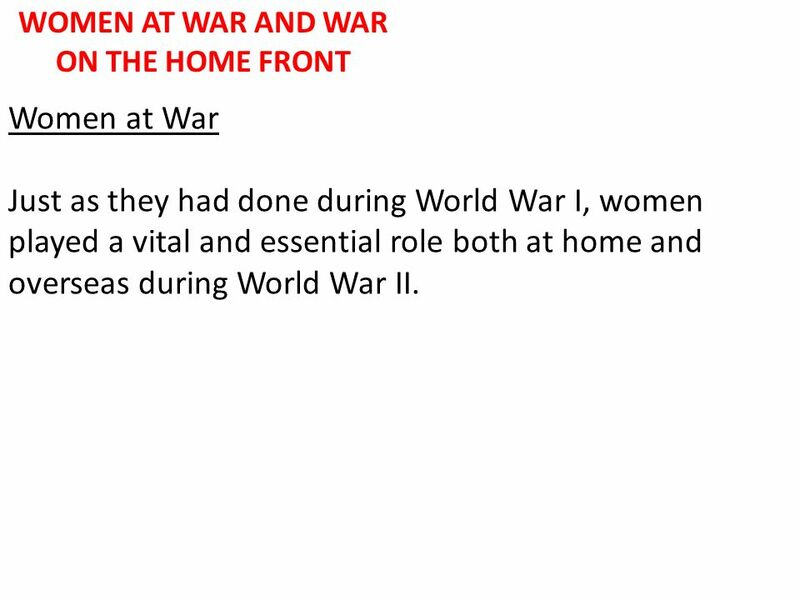 2 Women at War Just as they had done during World War I, women played a vital and essential role both at home and overseas during World War II. 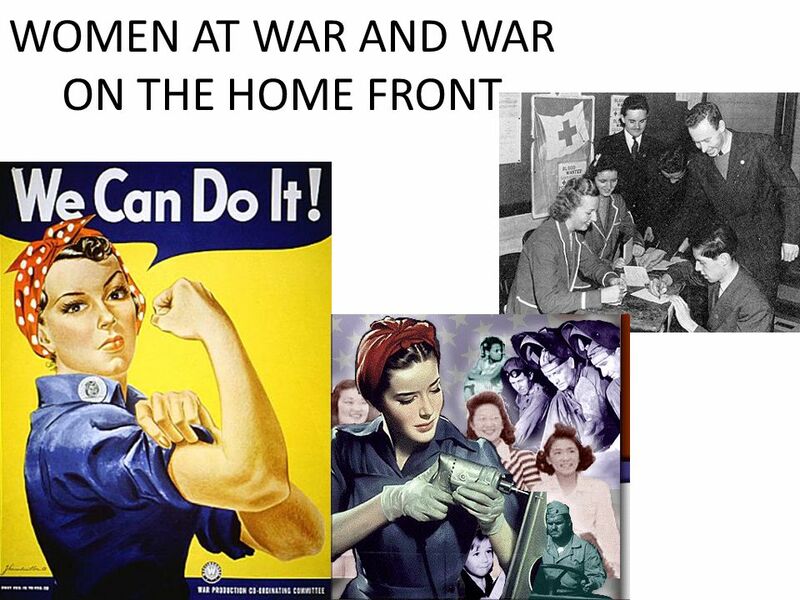 3 WOMEN AT WAR AND WAR ON THE HOME FRONT Women at War Propaganda once again encouraged women to do the right thing and contribute to the war effort. Roll Up Your Sleeves for Victory! was one popular slogan. Posters showed women with goggles, dressed in overalls, and wearing kerchiefs or turbans over their hair to keep it from getting caught in factory machinery. 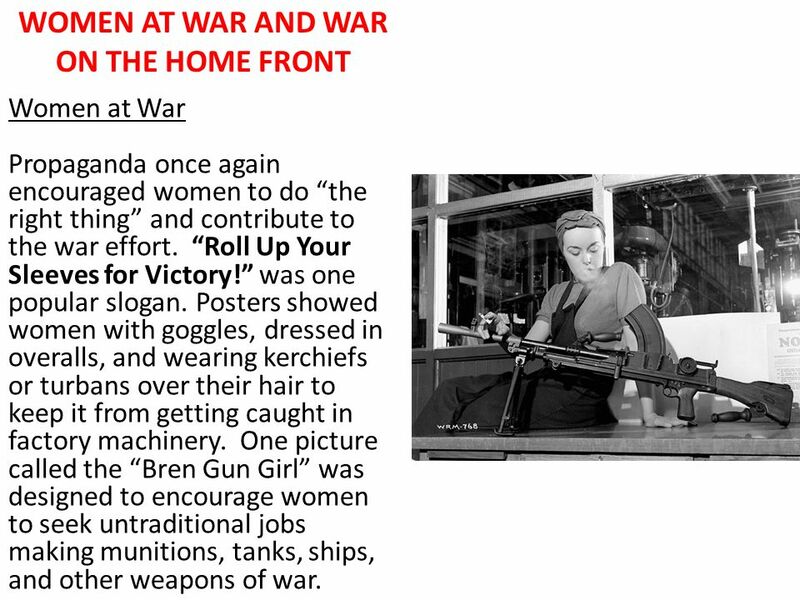 One picture called the Bren Gun Girl was designed to encourage women to seek untraditional jobs making munitions, tanks, ships, and other weapons of war. 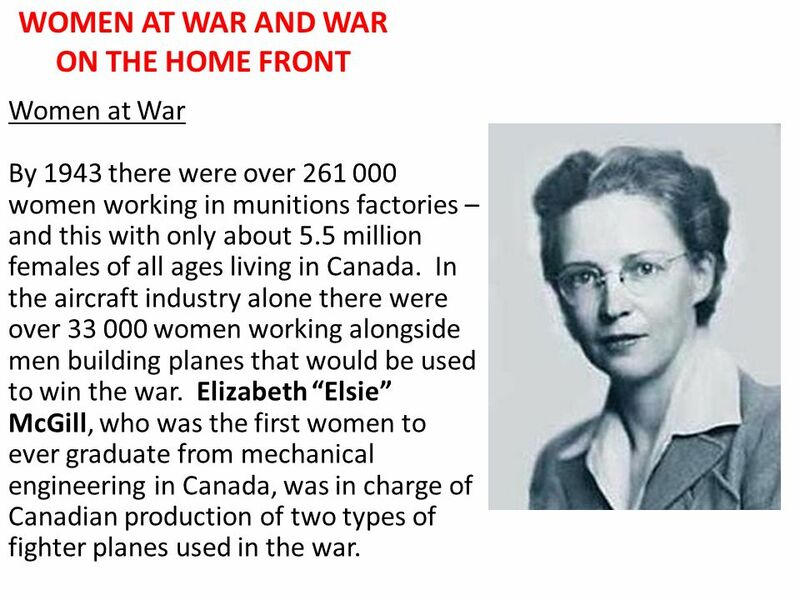 4 WOMEN AT WAR AND WAR ON THE HOME FRONT Women at War By 1943 there were over 261 000 women working in munitions factories – and this with only about 5.5 million females of all ages living in Canada. In the aircraft industry alone there were over 33 000 women working alongside men building planes that would be used to win the war. Elizabeth Elsie McGill, who was the first women to ever graduate from mechanical engineering in Canada, was in charge of Canadian production of two types of fighter planes used in the war. 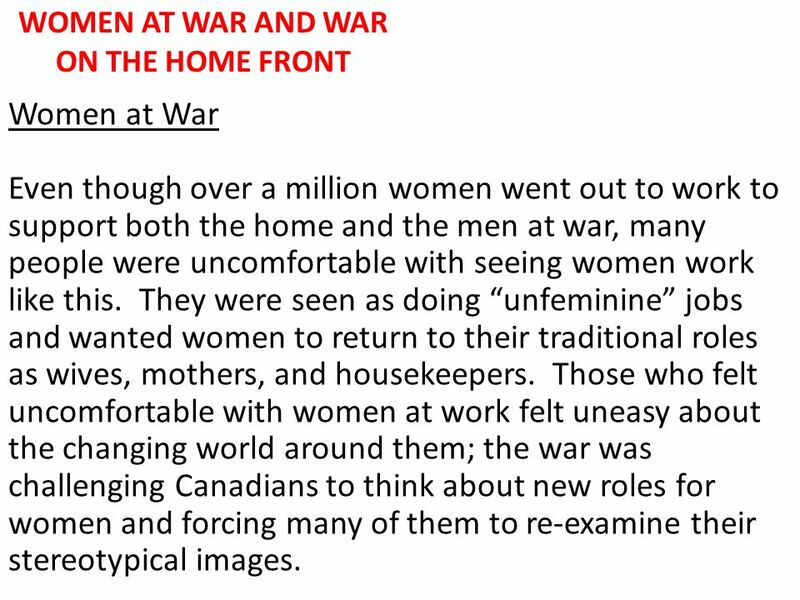 5 WOMEN AT WAR AND WAR ON THE HOME FRONT Women at War Altogether over 1 million women worked outside of the home during the war – about 17% of the total female population and about 33% of the total number of women working age (20-59) in Canada at the time. 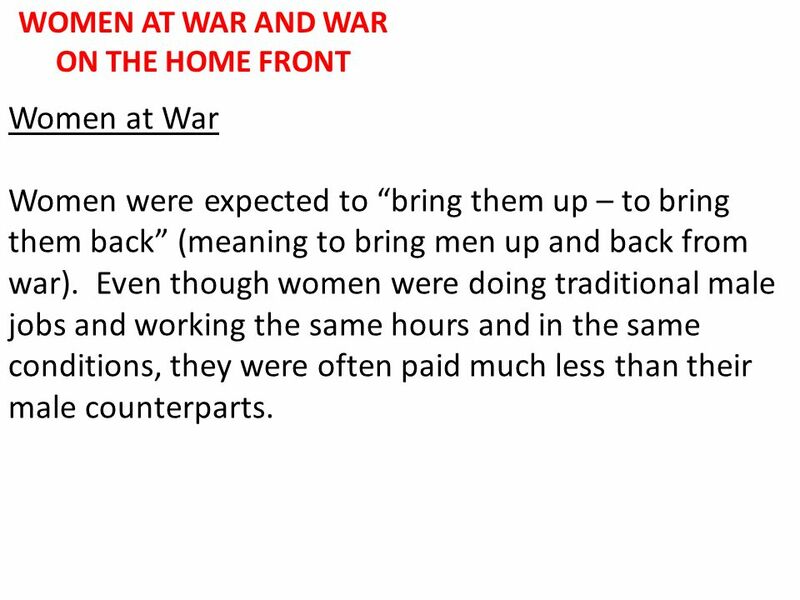 6 WOMEN AT WAR AND WAR ON THE HOME FRONT Women at War Women were expected to bring them up – to bring them back (meaning to bring men up and back from war). Even though women were doing traditional male jobs and working the same hours and in the same conditions, they were often paid much less than their male counterparts. 7 WOMEN AT WAR AND WAR ON THE HOME FRONT Women at War Even though over a million women went out to work to support both the home and the men at war, many people were uncomfortable with seeing women work like this. They were seen as doing unfeminine jobs and wanted women to return to their traditional roles as wives, mothers, and housekeepers. Those who felt uncomfortable with women at work felt uneasy about the changing world around them; the war was challenging Canadians to think about new roles for women and forcing many of them to re-examine their stereotypical images. 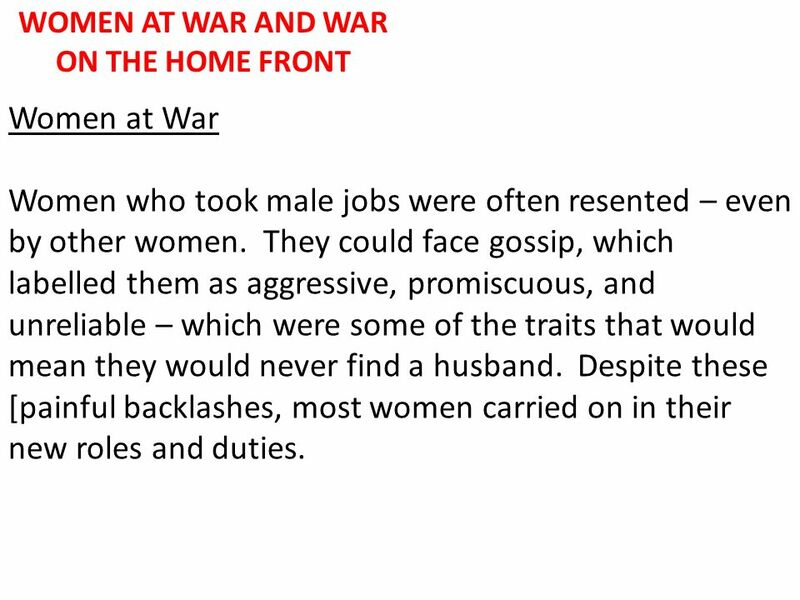 8 WOMEN AT WAR AND WAR ON THE HOME FRONT Women at War Women who took male jobs were often resented – even by other women. They could face gossip, which labelled them as aggressive, promiscuous, and unreliable – which were some of the traits that would mean they would never find a husband. Despite these [painful backlashes, most women carried on in their new roles and duties. 9 WOMEN AT WAR AND WAR ON THE HOME FRONT Women at War Slogans like from the frying pan to the firing line in government advertising encouraged thousands of homemakers to join the war effort to achieve victory. 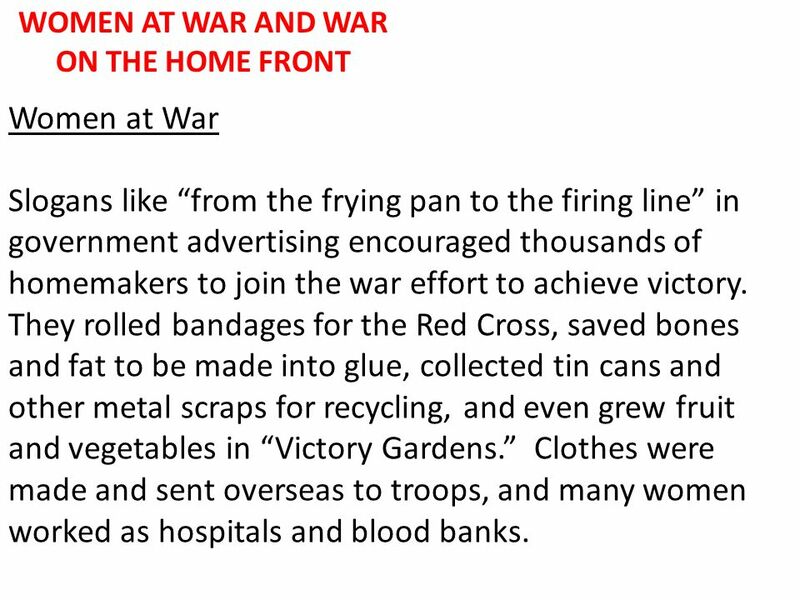 They rolled bandages for the Red Cross, saved bones and fat to be made into glue, collected tin cans and other metal scraps for recycling, and even grew fruit and vegetables in Victory Gardens. Clothes were made and sent overseas to troops, and many women worked as hospitals and blood banks. 10 WOMEN AT WAR AND WAR ON THE HOME FRONT Women at War They did face hardship, however: just as with what happened after World War I, many women would lose their jobs to the men returning home from war. 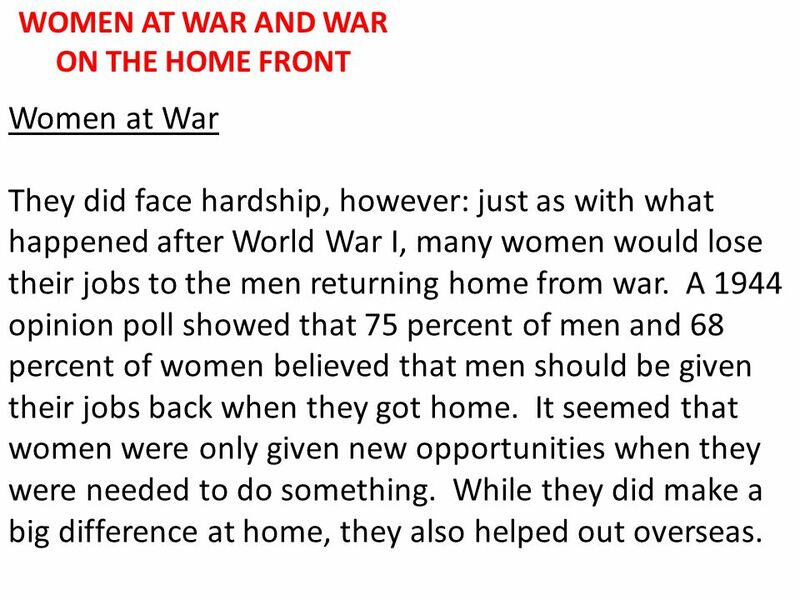 A 1944 opinion poll showed that 75 percent of men and 68 percent of women believed that men should be given their jobs back when they got home. It seemed that women were only given new opportunities when they were needed to do something. While they did make a big difference at home, they also helped out overseas. 11 WOMEN AT WAR AND WAR ON THE HOME FRONT Women in the War During WWII, 45,000 Canadian women volunteered for military duty. Every other woman in the country fought for "the cause" in her own way. Canadian women enlisted in the Women's Division of the Royal Canadian Air Force, as well as the Women's Royal Canadian Naval Service and the Canadian Women's Army Corp. In July, 1941, the Women's Division of the RCAF (Royal Canadian Air Force) was authorized by the government. Thousands of young women flocked to the recruiting offices to enlist. By 1945, 17,000 Women were in the Canadian Armed Forces. 12 WOMEN AT WAR AND WAR ON THE HOME FRONT Women in the War In August 1945, the Canadian Women's Army Corp was established. Training bases were established in Kitchener, Ontario; St Anne de Bellevue, Quebec; and Vermilion, Alberta. 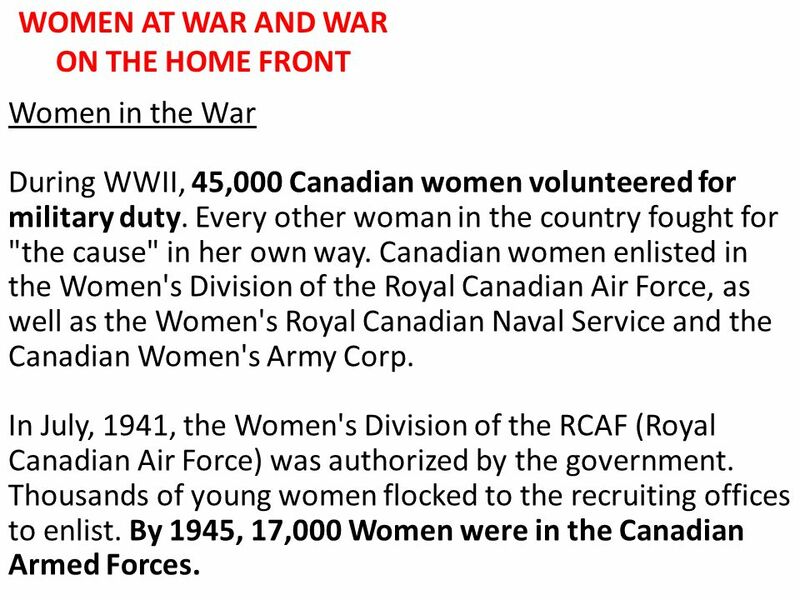 21,000 served in the Canadian Women's Army Corp (CWACs.) The Women's Royal Canadian Naval Services (WRENs) began recruiting in 1942. This division grew more slowly, but all women who served wanted to be part of the "real" war. 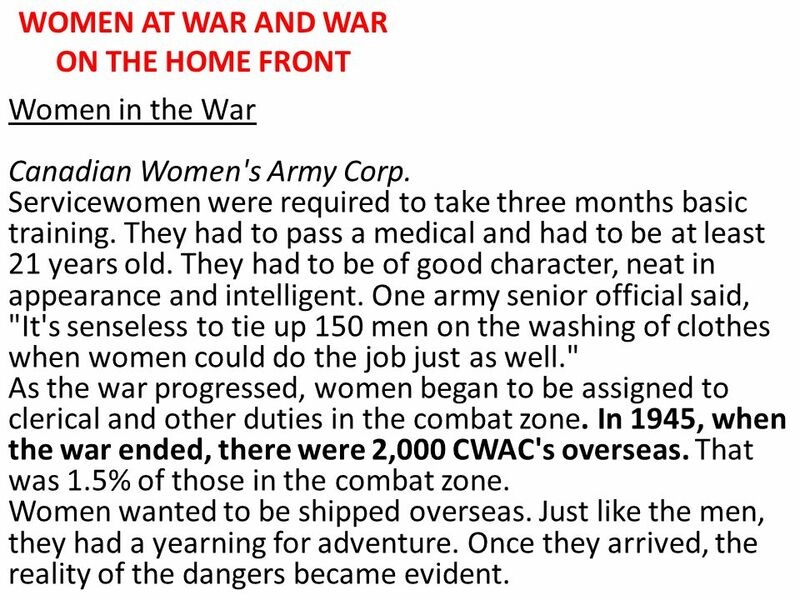 13 WOMEN AT WAR AND WAR ON THE HOME FRONT Women in the War Only one in nine of the 45,000 women who signed up were selected for duty overseas. 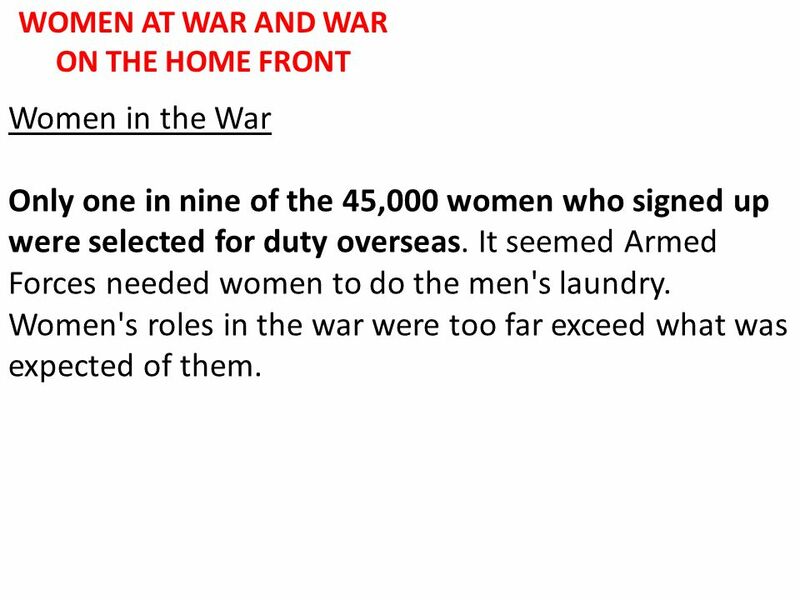 It seemed Armed Forces needed women to do the men's laundry. Women's roles in the war were too far exceed what was expected of them. 14 WOMEN AT WAR AND WAR ON THE HOME FRONT Women in the War Canadian Women's Army Corp. Servicewomen were required to take three months basic training. They had to pass a medical and had to be at least 21 years old. They had to be of good character, neat in appearance and intelligent. One army senior official said, "It's senseless to tie up 150 men on the washing of clothes when women could do the job just as well." As the war progressed, women began to be assigned to clerical and other duties in the combat zone. In 1945, when the war ended, there were 2,000 CWAC's overseas. That was 1.5% of those in the combat zone. Women wanted to be shipped overseas. Just like the men, they had a yearning for adventure. Once they arrived, the reality of the dangers became evident. 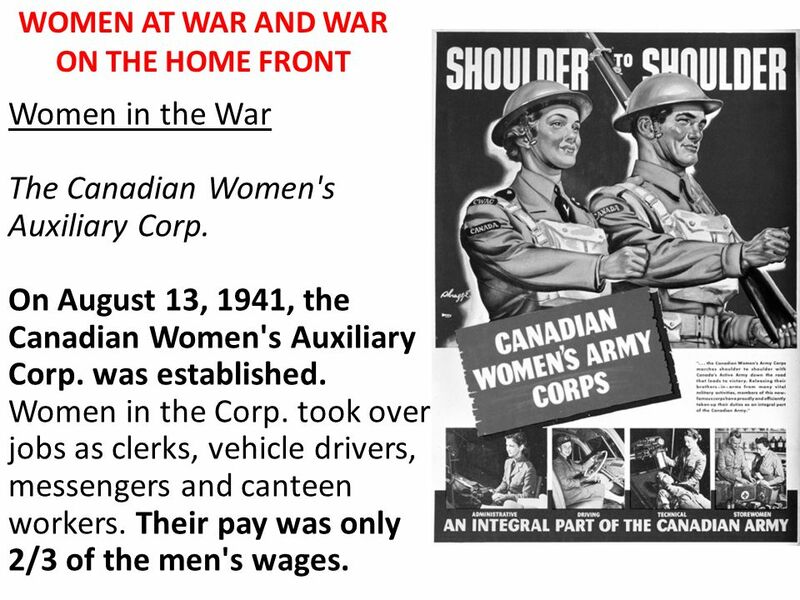 15 WOMEN AT WAR AND WAR ON THE HOME FRONT Women in the War The Canadian Women's Auxiliary Corp. On August 13, 1941, the Canadian Women's Auxiliary Corp. was established. Women in the Corp. took over jobs as clerks, vehicle drivers, messengers and canteen workers. Their pay was only 2/3 of the men's wages. 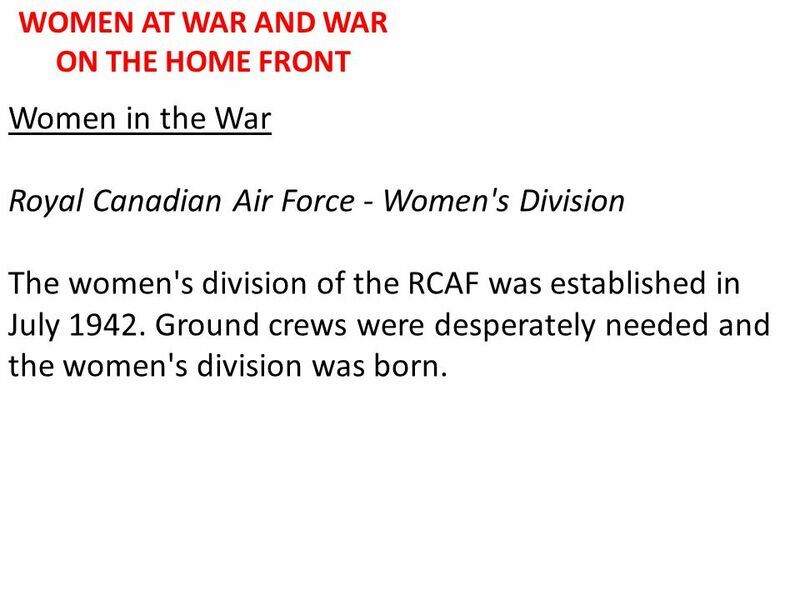 16 WOMEN AT WAR AND WAR ON THE HOME FRONT Women in the War Royal Canadian Air Force - Women's Division The women's division of the RCAF was established in July 1942. Ground crews were desperately needed and the women's division was born. 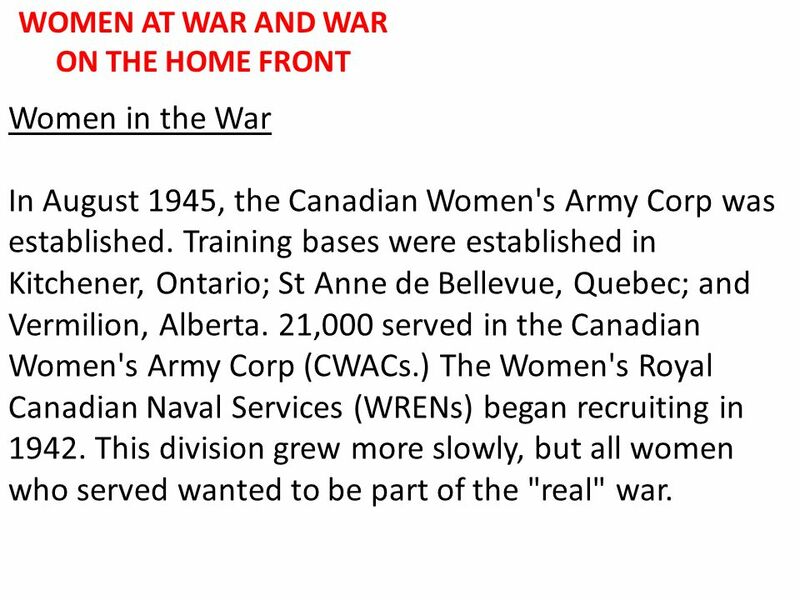 17 WOMEN AT WAR AND WAR ON THE HOME FRONT Women in the War The WREN's On July 31, 1942, the Women's Royal Canadian Naval Service was established. This division got the cream of the crop. The navy wouldn't look at a woman who didn't have excellent references. 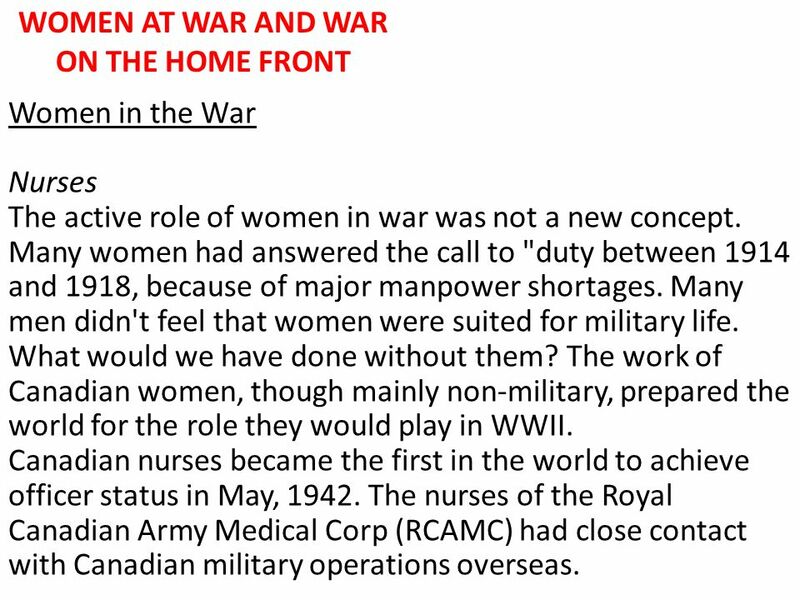 18 WOMEN AT WAR AND WAR ON THE HOME FRONT Women in the War Nurses The active role of women in war was not a new concept. Many women had answered the call to "duty between 1914 and 1918, because of major manpower shortages. Many men didn't feel that women were suited for military life. What would we have done without them? The work of Canadian women, though mainly non-military, prepared the world for the role they would play in WWII. Canadian nurses became the first in the world to achieve officer status in May, 1942. The nurses of the Royal Canadian Army Medical Corp (RCAMC) had close contact with Canadian military operations overseas. 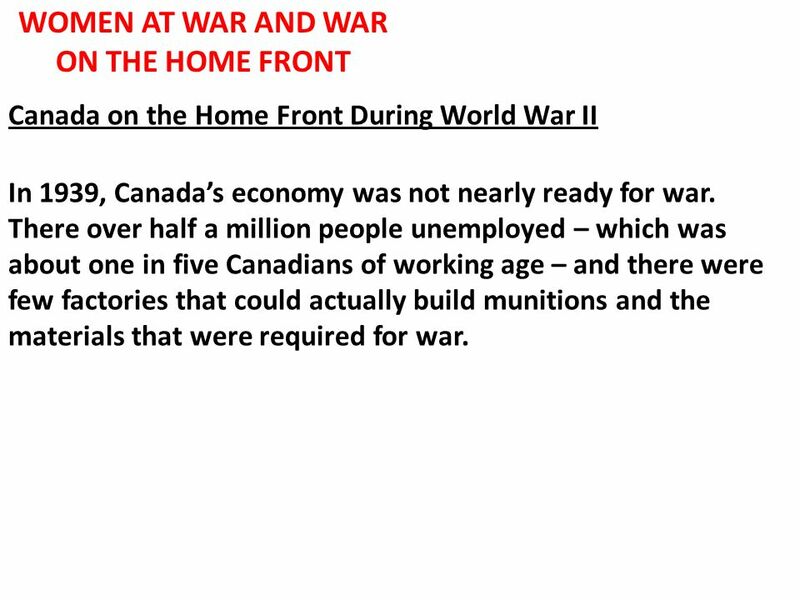 19 WOMEN AT WAR AND WAR ON THE HOME FRONT Canada on the Home Front During World War II In 1939, Canadas economy was not nearly ready for war. There over half a million people unemployed – which was about one in five Canadians of working age – and there were few factories that could actually build munitions and the materials that were required for war. 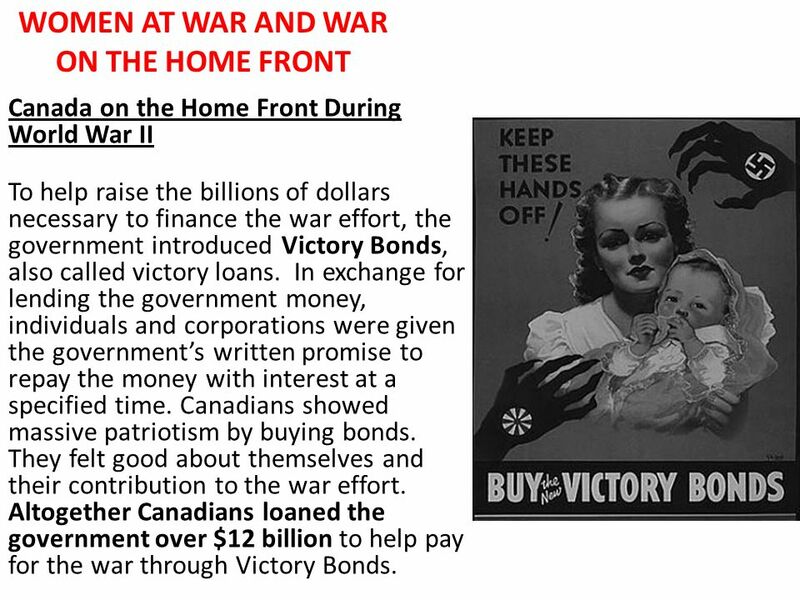 20 WOMEN AT WAR AND WAR ON THE HOME FRONT Canada on the Home Front During World War II To help raise the billions of dollars necessary to finance the war effort, the government introduced Victory Bonds, also called victory loans. In exchange for lending the government money, individuals and corporations were given the governments written promise to repay the money with interest at a specified time. Canadians showed massive patriotism by buying bonds. They felt good about themselves and their contribution to the war effort. Altogether Canadians loaned the government over $12 billion to help pay for the war through Victory Bonds. 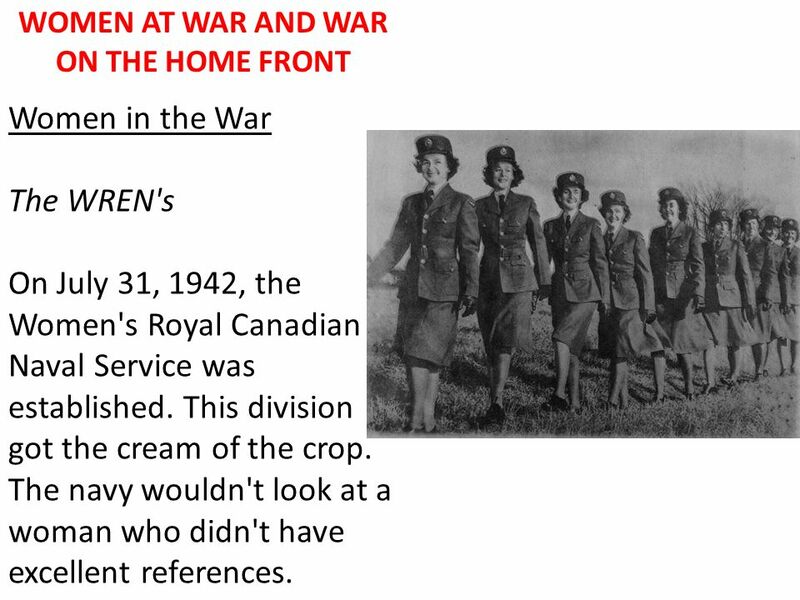 21 WOMEN AT WAR AND WAR ON THE HOME FRONT Canada on the Home Front During World War II Canadians also contributed to the war effort by rationing. This limited what people could buy at the store in an effort to make sure that as much food and supply went overseas as possible. Canadians received ration books that had coupons for essential goods such as coffee, sugar, butter, meat, and gasoline. When customers went to purchase these goods, they had to present their coupons to get what they wanted. 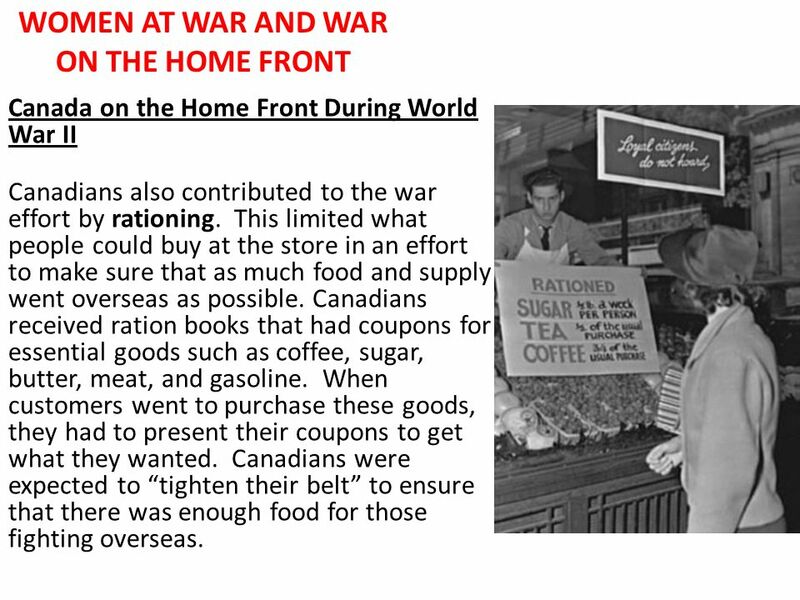 Canadians were expected to tighten their belt to ensure that there was enough food for those fighting overseas. 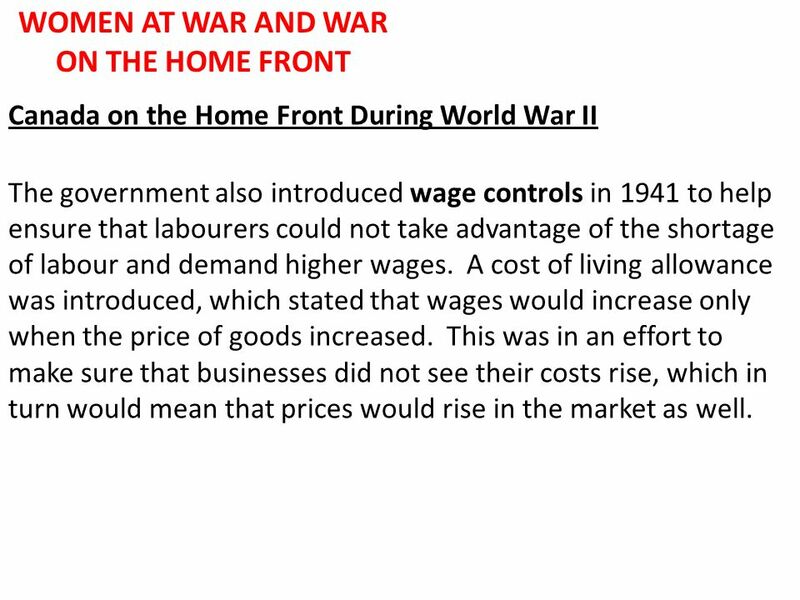 22 WOMEN AT WAR AND WAR ON THE HOME FRONT Canada on the Home Front During World War II The government also introduced wage controls in 1941 to help ensure that labourers could not take advantage of the shortage of labour and demand higher wages. A cost of living allowance was introduced, which stated that wages would increase only when the price of goods increased. This was in an effort to make sure that businesses did not see their costs rise, which in turn would mean that prices would rise in the market as well. 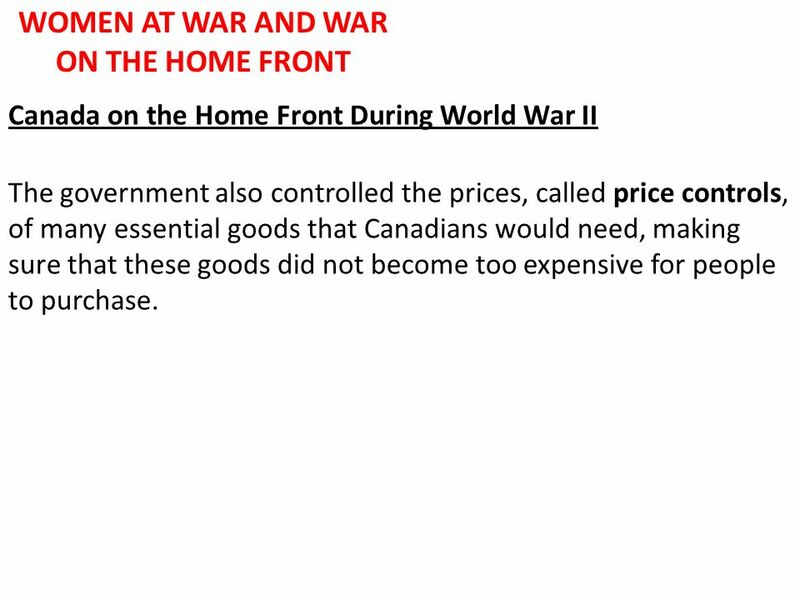 23 WOMEN AT WAR AND WAR ON THE HOME FRONT Canada on the Home Front During World War II The government also controlled the prices, called price controls, of many essential goods that Canadians would need, making sure that these goods did not become too expensive for people to purchase. 24 WOMEN AT WAR AND WAR ON THE HOME FRONT Canadian Culture During the War Years While the War was still raging in Europe, life for many Canadians went on. Rations were introduced and people bought Victory Bonds, but people still wanted to be entertained. Newspapers, radio broadcasts and newsreels reported on the latest efforts overseas and at home. Propaganda was everywhere, intensifying the hatred for the enemy and reinforcing the need to enlist and make every effort to win the war. In 1939 the government created the National Film Board (NFB) to produce films that reflected Canadian culture. 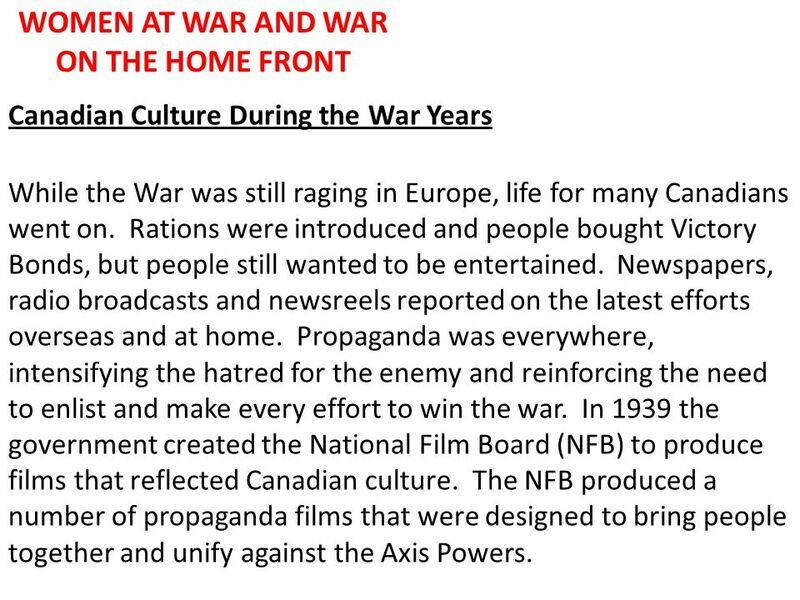 The NFB produced a number of propaganda films that were designed to bring people together and unify against the Axis Powers. 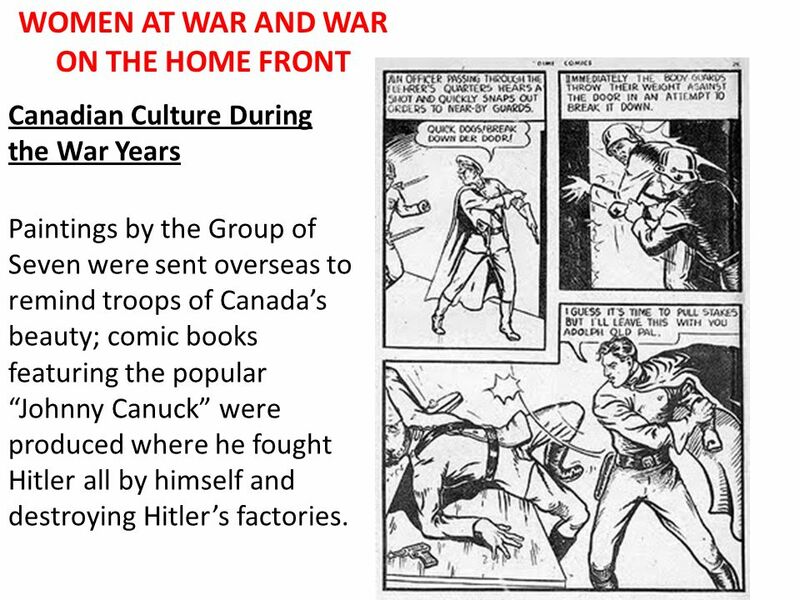 25 WOMEN AT WAR AND WAR ON THE HOME FRONT Canadian Culture During the War Years Paintings by the Group of Seven were sent overseas to remind troops of Canadas beauty; comic books featuring the popular Johnny Canuck were produced where he fought Hitler all by himself and destroying Hitlers factories. 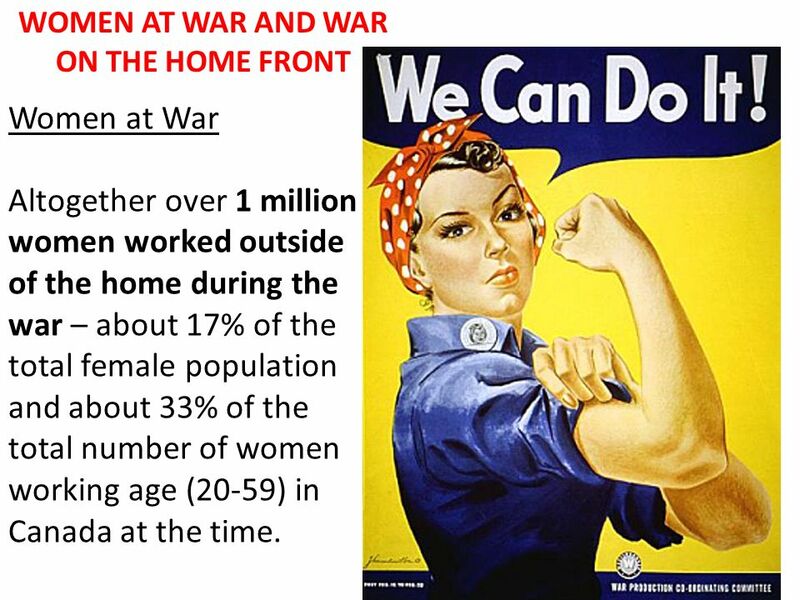 Download ppt "WOMEN AT WAR AND WAR ON THE HOME FRONT. Women at War Just as they had done during World War I, women played a vital and essential role both at home and." Mobilizing for Defense Ch The War Effort After the bombing of Pearl Harbor, the Japan Times boasted that the United States, now reduced to a third-rate. War on the Homefront World War 2 in Canada. Canada and the War : Women in World War 2  With so many men absent from home in the armed forces and with. We are leaning to:  Explain how American civilians support the war effort on the home front  Explain how the role of the U.S. government grew as it. OPENING ASSIGNMENT After Japan’s attack on Pearl Harbor, the US entered the war. Americans needed to mobilize a depressed peacetime country for war. The. Mobilizing for Defense Mr. White’s US 2 History. Big Questions How did the sacrifices of the people of the United States help the war effort? Would you. Complete “Unbreakable Code” #138 Think about what each military term does Then look at the list of words and think about which two seem the most alike.